Wow what an afternoon we had! 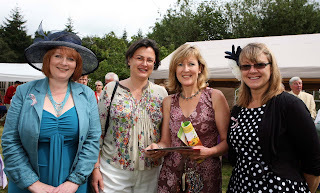 More than 100 people came along to our Vintage Tea Party on Saturday afternoon at Karryne's farm in Livery Road. The rain held off (mostly), and our guests were treated to a quintessential English tea - homemade cakes and fancies, and dainty sandwiches, all served on vintage bone china tea sets. Everyone dressed up, and there were some amazing outfits and hats galore! We were very privileged to welcome as our special guests Miss Anna Aertssen who is a consultant breast surgeon, and also Miss Sonnya Dabill, a senior breast care nurse, from the Salisbury NHS Foundation Trust. We also welcomed Sandra Baxter who represented the Stars Appeal. Pictured above are me, Miss Anna Aertssen, Miss Sonnya Dabill, and Karryne Hodgkinson, our hostess. Anna and Sonnya judged the hat competition, which was won by Ingrid Schmekel. Second place went to Debbie Miles who sported a fabulous hat decorated with a real bra, and third place was Ella James. Everyone had a really lovely time. Guests could have their portrait sketched by local artist Fiona Forbes, or browse the many tables of interest, including works of art by the Winterslow Art Group, contemporary jewellery and many others. Children's entertainment was provided by Sugar 'n' Spice. We raised an amazing £926.76! Thank you to everyone who helped make this possible.